Thanks in large part to Trump’s stimulatory fiscal policies, Wall Street is operating in splendid isolation from the rest of the world. The benchmark S&P 500 sharemarket measure is up 10 per cent this year – double its nearest rival, Japan’s Nikkei. European stocks have lost money, as have British equities. In US dollar terms, these major rival bourses are off 4 per cent and 6 per cent, respectively. 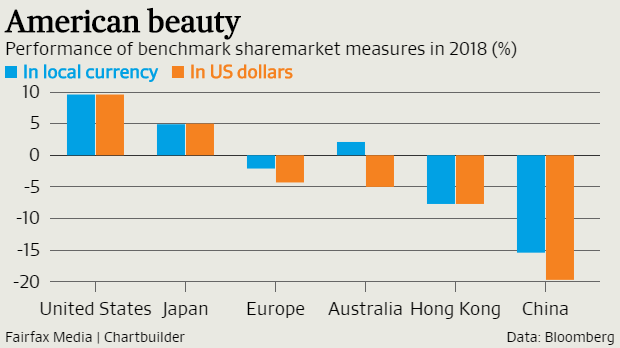 Aussie stocks are about 2 per cent higher, but from the perspective of American money managers – who comprise a big chunk of the capital invested globally – the ASX is down 5 per cent. Hong Kong equities have lost them 8 per cent. January has likely marked the peak of monetary policy accommodation globally for this cycle, and that has let fundamental factors such as earnings growth into the driving seat. And disappointing growth elsewhere, particularly in Europe over the first half of this year, has only exacerbated the US’s relative outperformance. “Everyone was caught off guard with this year’s deceleration in Europe,” Westpac senior economist Elliot Clarke says. Greenback strength has sparked turmoil in emerging markets, adding additional lustre to US financial assets as a safe haven. Global fund managers are increasingly betting on American exceptionalism. Big investors haven’t been this pessimistic on global growth in six years, Bank of America-Merrill Lynch’s monthly survey shows, even as their collective exposure to US stocks hits four-year peaks. Their optimism over the US earnings outlook is at its highest since 2001. In other words, the rest of the world’s pain has proved Wall Street’s gain. How long this sugar hit can last is an open question. The trade looks very stretched. Inevitably the American corporate earnings outlook will cycle lower as upcoming quarters are compared to the blockbuster profit numbers from a year earlier. The current government spending boost is due to expire this time next year. Meanwhile, the Federal Reserve is likely to lift rates this week, again in December, and perhaps three times next year. By that stage US monetary policy is likely to have gone from “loose” to “tight”. “As you move into and through next year that’s where you get more uncertainty” on the US economy’s prospects, Clarke says. By Monday afternoon, the US had imposed additional tariffs of 10 per cent on an extra $US200 billion ($277 billion) worth of Chinese imports, bringing the total to $US250 billion or about half of the total value of all imports from the Asian giant. Chinese authorities responded by imposing 5 to 10 per cent extra taxes on $US60 billion of American goods. That retaliation from China will be the trigger for that latest 10 per cent tariff to be lifted to 25 per cent by the new year, with the remaining $US267 billion of Chinese imports now also in the crossfire. Every orthodox economist will repeat ad nauseam that “nobody wins a trade war”, but the current period of American exceptionalism is clearly undermining this message. “New economic records being set on a daily basis – and it is not by accident!” Trump crowed on Twitter over the weekend. In the latest shot in the trade war, Trump is in increasing danger of hitting his own foot, economists at S&P Global Ratings reckon. “We believe that the ‘shock’ arising from this escalation by both sides could eventually have a larger proportionate impact on the US economy than China’s,” they write in a recent report. A full escalation of the US-China trade war that has both countries inflicting 25 per cent tariffs on trade both way would cumulatively shave about 1.2 percentage points off US GDP over 2019-21, the S&P analysts say. China would lose 1 percentage point over the same timeframe. This is not the narrative working in markets today. But America’s splendid isolation is more likely to be a 2018 story than a 2019 one.